Few things in life are more important to this beauty chick than clean hands. With all the running around on New York City streets, touching subway poles that god knows who else has touched, and typing away all day on a somewhat greasy and disgusting keyboard, I'm a bit of a fanatic at making sure my digits stay as clean as possible. 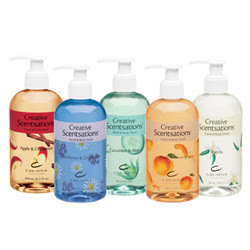 With all the soaps out there to choose from, there's never a shortage of options -- but recently I'm totally in love with the Creative Scentsations line, put out by Creative Nail Design. Made with light moisturizers that leave your skin feeling soft and silky smooth, this hand washes are as luxe as they come, and at a fraction of what they could actually cost! Choose from 15 amazing scents, including Pear & Dandelion, Melon & Jasmine, Apple & Cinnamon and Honeysuckle & Pink Grapefruit -- each one more wonderful and intoxicating than the next! A couple of pumps and your hands will be feeling good as new.